You can download this prayer for your use or share with others. O Lord Jesus, hide me in the wound of your sacred heart. Free me from my desire to be loved and esteemed. Guard me from my evil attempts to win fame and honor. Make me humble till I become a small spark in the flame of love in your Sacred Heart. Grant me the grace to forget myself and all worldly things. Jesus, sweet beyond words, convert all worldly consolations into bitterness for me. 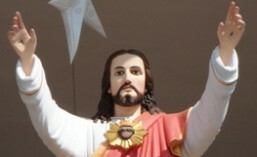 O my Jesus, Sun of Justice, enlighten my intellect and mind with your sacred rays. Purify my heart, consume me with burning love for you, and make me one with you. Saint Alphonsa who lived as an unknown simple clarist nun within the four walls of the Franciscan Clarist convent at Bharananganam, in the state of Kerala, is now known all over the world. Her extraordinary power of intercession before her beloved Spouse Lord Jesus Christ, made her dear to everyone. Thousands of people from all walks of life irrespective of caste, creed, religion or country flow to the tomb of the saint to pray for their various needs and to pay homage and gratitude for the innumerable favours they received. Read more and watch video of the shrine and life history. Saint Alphonsa who lived as an unknown simple clarist nun within the four walls of the Franciscan Clarist convent at Bharananganam, in the state of Kerala, is now known all over the world. Her extraordinary power of intercession before her beloved Spouse Lord Jesus Christ, made her dear to everyone. Thousands of people from all walks of life irrespective of caste, creed, religion or country flow to the tomb of the saint to pray for their various needs and to pay homage and gratitude for the innumerable favours they received. O Lord Jesus, hide me in the wound of your sacred heart. Free me from my desire to be loved and esteemed. Guard me from my evil attempts to win fame and honor. Make me humble till I become a small spark in the flame of love in your Sacred Heart. Grant me the grace to forget myself and all worldly things. Jesus, sweet beyond words, convert all worldly consolations into bitterness for me. O my Jesus, Sun of Justice, enlighten my intellect and mind with your sacred rays. Purify my heart, consume me with burning love for you, and make me one with you. St. Alponsa was born on 19th August 1910 as the fourth child of Joseph and Mary Muttathupadath, in the parish of Kudamaloor in the state of Kerala. She was baptized on the 27th August. Her baptismal name was Anna and her pet name Annakutty. Her mother passed away three months after her birth. Annakutty started her schooling at Arpookara and left for Muttuchira Govt. School for pursuing her studies from the fourth class onwards under the immediate supervision of her maternal aunt Annamma Muricken. The aunt brought her up extremely affectionately, but equally strictly also. Her one ambition was that the child should be brought up as a respectable housewife for a deserving bridegroom. Annakutty had a vision of St. Theresa of Liseux whose life in spired her to become a religious. She therefore did not yield to any marriage proposal. Finally when she was almost compelled to be betrothed at to the church, she extricated herself from it by voluntary burning her foot placing it an ash pit of burning husks. Against such determine resistance the aunt succumbed to her desire and permitted her to join a convent . Annakutty joined Clarist convent at Bharananganam in 1927 on the feast of Pentecost. She recived the veil postulant on second August 1928 with the name Alphonsa. Her vestition was on 19th May 1930. Later she joined the St. Theresa’s School Changanacherry for higher studies, on completing which she engaged in teaching for a period of one year at Vakakkad. Sr. Alphonsa entered the novitiate on 12th August 1935. During this period, she had a sever attack of hemorrhage and it was feared that she would have to be sent back. But on the ninth day of novena held by her and the community seeking intercession of Fr. Kuriakose Elias Chavera, she was miraculously cured her. She completed the novitiate and made the solemn profession of her religious vows on 12th August 1936. Sr. Alphonsa continued to have her repeated spells of sickness and pain. She was on a bed of thrones torn and tortured by excruciating pain and prolonged agony. Here was an rejoiced in the lord and magnified Him. She was longing to suffer even more for her own sanctification and that of the world. She constantly advised her companions and novices to accept suffering cheerfully citing the biblical references to the grain of wheat which has to fall down and decay for raising new sprouts; it has to be ground in order to be turned into hosts for transformation as the body of Our Lord. She also reminded them of the grapes which have to be crushed for yielding wine to become the blood of the Lord. Her death(28th July 1946) was unnoticed by the public. The funeral was simple and thinly attended. But soon the school children , who loved her received favors through her intercession. Her tomb at Bharananganam turned into a great centre of pilgrimage attracting people from far and near. Bharananganam town is located 5 kms east of Palai in Kottayam district on the Kottayam – Erattupett Road. Palai lies 30 k.m southwest of Kottayam. Rail : The nearest railhead is Ettumanoor which is 12 kms from Palai and the nearest railway station is at Kottayam (33 km) and is connected with major cities of South India. Road : There are frequent buses from Kottayam and Palai to Bharananganam, and Kottayam is well connected by road to all important South Indian cities and towns.